Microdermabrasion is a treatment option for people with superficial skin problems and who are looking for no downtime after the treatment. It smooths skin and exfoliates away dead skin cells with gentle abrasion boosting collagen production while revealing a more youthful layer of fresh, glowing skin. Designed to reduce the appearance of skin flaws such as fine lines and wrinkles, acne scars and age spots, Microdermabrasion deeply exfoliates the skin, enhancing clarity, texture and tone. Areas closer to the eyes and mouth can be abraded more accurately with Diamond Tip Microdermabrasion (no risk of stray crystals causing damage or being ingested). Natural diamond tips are unlikely to leave tiny particles in the eyes, nose or mouth. 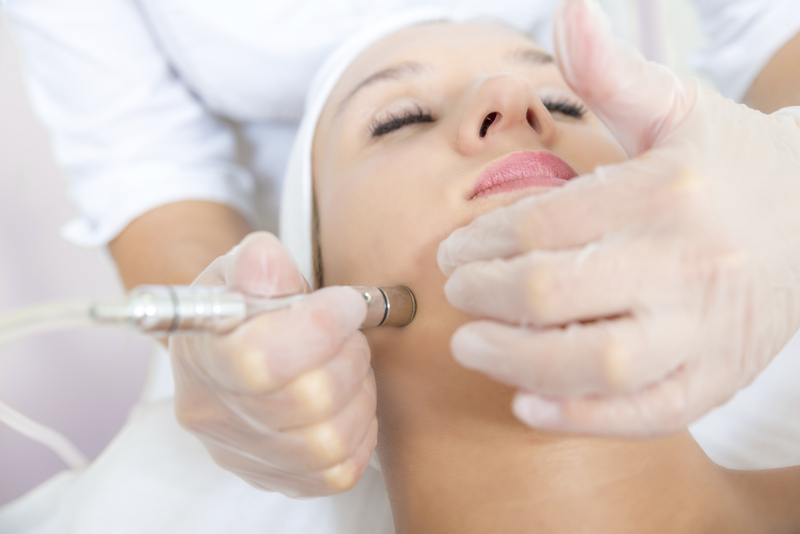 A Crystal Microdermabrasion option is available for irregular surfaces or based on patient preferences. Note: For the sake of both perceived safety and effectiveness, crystal microdermabrasion machines (with aluminum oxide or sodium bicarbonate crystals) are slowly being phased out and replaced with diamond microdermabrasion machines.